vacancies in this Bihar BSPHCL Jobs recruitment 2018. Candidates selection for this BSPHCL Recruitment will be based on written exam only. Candidates must have qualified ITI Electrician or Diploma EEE or ECE or B.E/B.Tech in EEE or ECE for applying this BSPHCL Recruitment of JLM, Asst Operator, SBO jobs. Required qualifications having interested candidates can apply online for this BSPHCL Jobs through bsphcl.bih.nic.in website from 18-09-2018 to 08-10-2018. Written exam date is last week of October-2018. 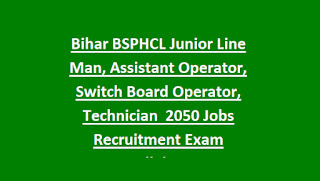 For more details regarding this BSPHCL Recruitment of Junior Line Man, Switch Board Operator, Technician Grade IV, and Assistant Operator jobs selection process, exam pattern and syllabus, qualifications and other details are given below. Refer official notificaiton for category wise vacancies. Age limits as on 01-01-2018 is 18-37 years, for BC/EBC candidates 3 years and for SC/ST 5 years of upper age relaxation is applicable. For UR female upper age limit is 40 years and for BC/EBC/SC/ST female upper age limit is 42 years. Application fee is Rs.1000/- for General/BC/EBC candidates and Rs.250/- for SC/ST candidates. For all the posts Matriculation with ITI Electrician Trade or Diploma in Electrical or Electronics engineering, OR B.E/B.Tech in Electrical or Electronics Engineering. An objective type written exam will be conducted for this BSPHCL recruitment of various posts. An objective type written exam will be conducted for this BSPHCL Vacancies. 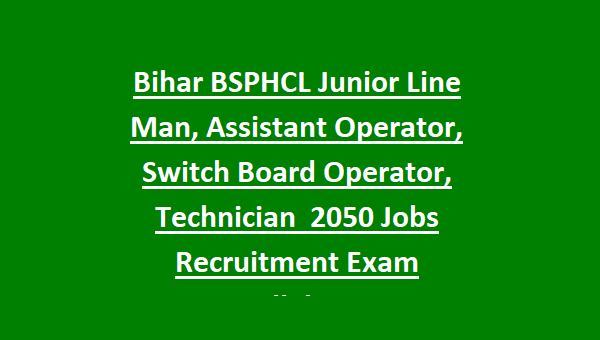 Online applications only accepted for this BSPHCL Jobs Recruitment of Technician Grade IV, Switch Board Operator, Junior Line Man, Assistant Operator Posts. Official website of BSPHCL is www.bsphcl.bih.nic.in. Last date for submission of application form online 09-10-2018. Written exam pattern and syllabus, exam date, exam admit card details are available in this website.